CSI introduces a new insecticide concentrate for adult mosquito control, including those that transmit West Nile, chikungunya and Zika viruses. 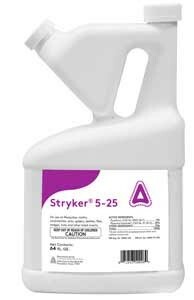 Stryker 5-25 is a water-based, micro-emulsion blend of pyrethrin and piperonyl butoxide (PBO). Labeled for mosquitoes, gnats, midges and other many flying insects, it provides quick knockdown with a short residual and no phytotoxicity. It’s available in 64-oz. bottles, which will make 55 gal. of finished product for mosquito misting systems.